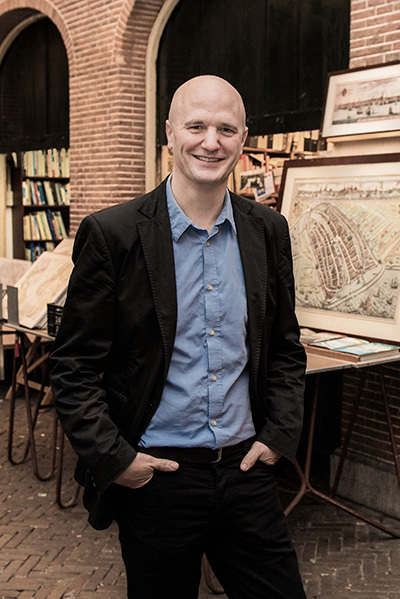 Christoph Lindner, professor of media and culture at the University of Amsterdam, will join UO as the new A&AA dean beginning August 15. With a CV that includes research in globalization, sustainability, and creative practice, Lindner brings a unique roster of qualifications and perspective to lead A&AA. We caught up with him recently to ask a few questions via e-mail about how he envisions A&AA’s future. Above: Christoph Lindner will join the UO faculty as Dean of the School of Architecture and Allied Arts in August 2016. Photo: Maartje Strijbis. Question: You can be considered a true global citizen. You’re a US citizen living in the Netherlands, you were educated in Colorado and Scotland and other places, and now you’ve returned to the United States. What prompted you to seek an avenue back to the US? Answer: My parents were American but I was born in Paris and grew up in London and Geneva. So I’ve always been pulled between Europe and the U.S. and have lived, studied, and travelled a lot on both sides of the Atlantic. What brings me back to the U.S. now is not the country—although I’m really excited about living in the Pacific Northwest—but A&AA. I could have moved anywhere in the world to pursue my academic interests, but I was drawn to A&AA because of the school’s unique interdisciplinary community and its commitment to sustainability and social equity. I also think that the combination of theory and practice in A&AA makes it particularly well suited to thrive in today’s educational landscape where academic excellence requires both innovation and impact. Question: Your research and teaching explore issues of urbanism and globalization and material culture. Can you share some of your latest projects and presentations on these subjects? Answer: Over the last few years, my work has become increasingly focused on issues of precarity and sustainability—but always in relation to visual culture and the built environment. This has led to projects like my recently published book Global Garbage and a new book project titled Slow: Decelerated Living in an Accelerating World. In recent months, I’ve been writing and giving talks on topics like the politics of urban pollution, ruin aesthetics in Detroit and Mumbai, gentrification and street art in Amsterdam, and the rise of elevated parks in cities such as New York and São Paulo. What connects these diverse topics is an interest in the impact of globalization on the space and communities of contemporary cities. Question: From your perspective, what do you think A&AA can bring to the conversation on ecological challenges and sustainability? Answer: When it comes to the built, natural, and social environments, there is a tremendous amount of expertise in A&AA. In every department, faculty members are working at the leading edge of their disciplines to address ecological challenges and to advance sustainability as both a value and a practice. We can see this in many spaces, such as the school’s Urban Farm, the printmaking program’s commitment to developing non-toxic chemical alternatives, the architecture lab in Energy Studies in Buildings, the course on Inclusive Urbanism, and the Sustainable Cities Initiative—to name just a few examples. Putting all this together, it is clear that A&AA is pioneering approaches to sustainable living that are focused on solving real-world problems. What I find particularly impressive is the way that A&AA never loses sight of the social/human dimension of sustainability. One of the important contributions A&AA can make in this area is to bring its work on sustainability to a wider public, since the school’s research and teaching have many direct applications. This is already happening, of course, and a key part of my job is to help boost the visibility and impact of A&AA’s work in this area. Working together with the Eugene campus, the UO’s “footprint” in Portland is vital in this respect because of all the additional publics it allows A&AA to reach. 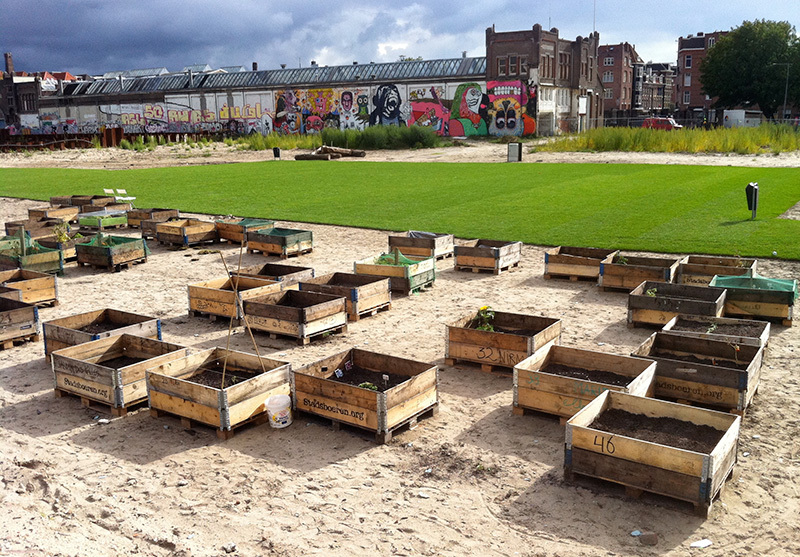 Above: Lindner’s research interest includes urban farm pods, pop-up park, and street art mural, pictured here in Amsterdam, 2012. Question: Research is an important priority for the UO. How do you view research and creative work in the School of Architecture and Allied Arts and what methods would you use to facilitate research productivity within the School? Answer: If you want to stimulate more and better research, you need to give people the space and resources to pursue their ideas. You also need a climate of ambition, collaboration, and experimentation. A&AA has much of this in place already and the next step is to connect areas of strength across departments and to link these up with the best research groups and initiatives worldwide. Just as importantly, there also needs to be plenty of space open for A&AA to develop new areas of research excellence. A&AA is big enough and diverse enough to be a leader in a range of fields and we should not feel constrained by our current academic identity, but rather inspired by that identity to continue evolving. As for creative work, I don’t see it as being separate from research. As any artist or designer will tell you, creative practice also involves substantial research and innovation. And this is one of the great assets of A&AA: the school does not engage in just one kind of research. Rather, the academic and creative knowledge generated at A&AA is disseminated in a rich variety of forms, from books, articles, and conferences to buildings, landscapes, and exhibitions. This enables A&AA to reach multiple publics within and beyond the academy, and to contribute to contemporary social and cultural debates on many fronts. Question: We feel the UO is in an important transformative time as it works on improving access, achievement, and student success, especially for undergraduate students. How do you approach the role of teaching at a research university and what do you think is important for student success in A&AA? Answer: Research and teaching are intrinsically linked. You can’t do one well without doing the other well. So I’ve always resisted the idea that research-led universities are somehow less interested in teaching or less committed to student success. This really is not the case and the best research universities like the UO understand that innovation frequently comes from – and always feeds back into – the classroom. Looking to the future, I want to encourage A&AA to involve students even more in research projects and activities, especially in international contexts. A&AA already has an excellent track record in this area, and it is something that we will continue to build on. Another key aspect of student success is access: if you can’t get to university in the first place, you can’t succeed there. And as we all know, one of the biggest obstacles to higher education is the cost. Growing scholarship funding with a view to widening access will not only give more students an opportunity to succeed, it will also enrich and diversify the academic community, which is essential to the intellectual and creative energy of a research university. Question: Should the opportunity present itself, what courses would you like to teach at UO? Answer: I definitely want to do some teaching in A&AA. It’s important to experience the university and to spend time with students in a classroom setting. I have lots of ideas for courses – topics like “Slow Architecture,” “Eco-Aesthetics,” and “Creative Urbanism” – but whatever I end up teaching I hope to do it together with other colleagues at A&AA. Co-teaching is something that I have always enjoyed and this kind of collaboration lends itself well to interdisciplinary and experimental learning. Question: What are you looking forward to doing first when you and your family are settled in Oregon? Answer: After we hit Trader Joe’s and stock up on chocolate Mochi, we want to start exploring town and the surrounding area. Coming from a dense, hectic city like Amsterdam, we are really looking forward to spending some time outdoors hiking and camping. I’ve also promised my children that we’ll go whale watching as soon as possible. Tips for beautiful places to visit in Oregon are most welcome! Above: Lindner examines diverse topics in his research, writings, and public lectures such as the impact of globalization on the space and communities of contemporary cities. Images from his investigations include this detail of H.A. 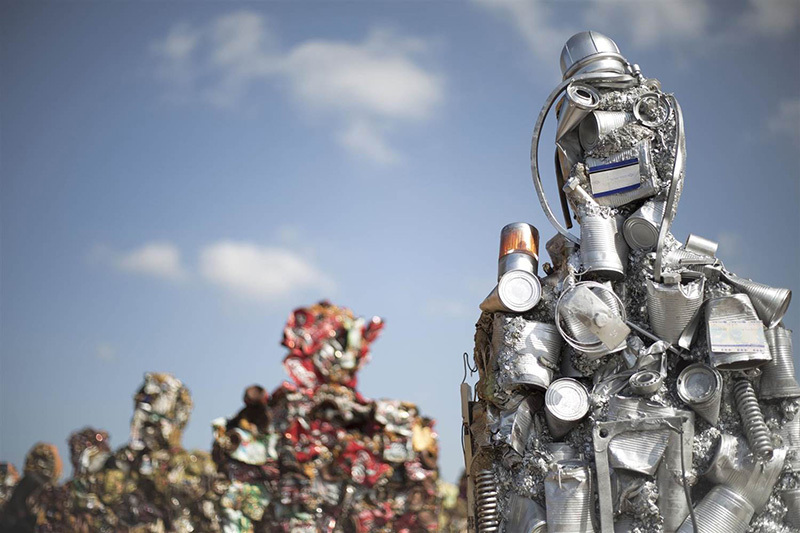 Shult’s “Trash People" installation in Tel Aviv, 2014. 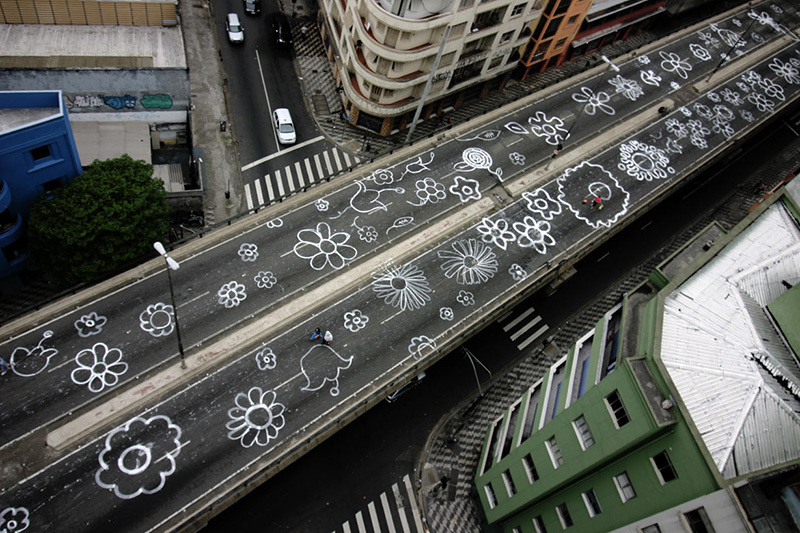 Above: The Minhocão elevated highway in São Paulo, 2011.